Common Armament Test Set - MTS-209 | Marvin Test Solutions, Inc. 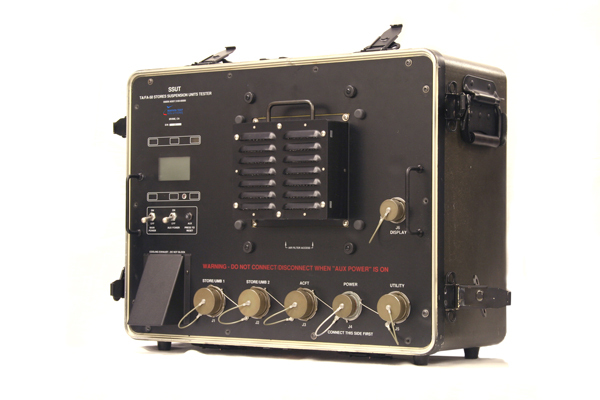 The MTS-209 is a state-of-the-art portable test set for various armament systems used on the F-16, F-15, F-18, TA-50, FA-50 and additional aircraft. The MTS-209 supports a wide range of Alternate Mission Equipment (AME) including launchers, pylons, and racks. It combines the test capabilities of an I-Level test set in a compact, rugged, flight-line qualified enclosure. The MTS-209 performs parametric functional tests on AME components including Launchers (LAU-117, 16S210, LAU-127,, LAU-128, LAU-129, LAU-7,etc. ), bomb racks (MAU-12, MAU-50, SUU-20, TER-9, etc. ), Remote Interface Units (RIUs) and Pylons. The MTS-209 can also test MIL-STD-1760 aircraft stations and weapon systems. The core design of the MTS-209 is based on the proven and fielded MTS-207: Rugged Field Test Set which has been successfully deployed worldwide. The robust and modular PXI-based design of the MTS-209 provides for upgradeability to support additional platforms and weapons systems. The MTS-209 is controlled by a removable integrated LCD display and touch screen — the Remote Control & Display Unit (RCDU) or via a ruggedized laptop or tablet. The RCDU / laptop / tablet allow operation of the MTS-209 from distances of up to 25 feet using a menu-driven, graphical user interface (GUI). The modular PXI chassis is secured via five shock absorbers which allows the MTS-209 to meet stringent shock and vibration requirements. Built-in heaters for the PXI chassis and the RCDU allow the MTS-209 to operate in extremely low temperatures. The menu-driven design of the MTS-209 simplifies operation and minimizes required training and cumbersome tech manual use during operation. A menu-driven structure, developed using ATEasy, guides the user and creates an operational environment that virtually eliminates operator errors. Cable detection is automatic and, in the event of a misconnection, clear prompts instruct the user as to which cables are required and how to identify and connect them. The MTS-209 was designed to support many additional weapons systems and platforms and can be easily upgraded to test similar armament systems on additional platforms such as A-10, F-22, F-35, and F-18. MTS-209 variants such as the MTS-206, MTS-207, AN/TSM-205B, and the MTS-235 are already being used on The F-35, MC-130, and the Maverick and Hellfire missile systems (platform independent). The modular design and construction of the MTS-209 provides for simplified maintenance and reduced logistics. A comprehensive self-test program utilizes a self-test adapter to perform a complete test of all MTS-209 hardware including Circuit Card Assemblies (CCAs) and cables and provides troubleshooting to the faulty assembly. Using an available spare parts kits, customers can organically support the MTS-209 by replacing CCAs and cables according to self-test troubleshooting data. The high MTBF and low MTTR ensure minimal downtime and continuous trouble-free use in the harshest operational environments. The MTS-209 employs an innovative calibration technique that further simplifies maintenance and reduces scheduled maintenance down-time. Multiple NIST-traceable high-precision references have been incorporated into the design of the MTS-209. The test set verifies its calibration status against these references every time the self-test is performed and in the event the test set is out of calibration, the user is instructed to initiate an automated calibration procedure that calibrates the test set measurement and stimuli devices against the built-in references. The references have to be checked once every 2 years using standard PMEL equipment that can be brought to the field, eliminating the need for evacuation of the test set to the depot or the PMEL facility. The unique software architecture of the MTS-209 allows customers to add their own custom test programs for AME not supported by the MTS-209. This innovative architecture allows customers to do so without compromising the integrity of all standard MTS-209 test programs.